Brazil: Rio de Janeiro, Iguazu Falls, the Pantanal and Jaguars! How did we choose Brazil? 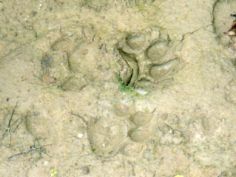 We had read a recent article on the Pantanal and jaguars. Put all of that together, and it just sounded like something we should do. ...but we did not see jaguars. We went back later, went deeper into the Pantanal and had great sightings of those beautiful cats! For a trip like this, wandering isn't the best option.... a little research is in order. You also need to allow time to get a visa. 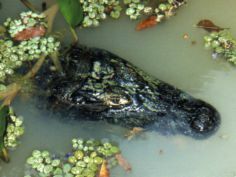 After some searching on the internet, we came up with a wildlife travel company that could help us in the Pantanal, and we set up an itinerary for that part of the trip. We also decided that we wanted to stay in the National Park at Iguazu. 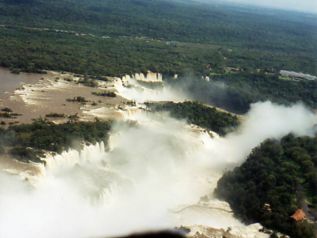 This is really two national parks.... the river divides Brazil and Argentina, and they share the falls. We called ahead and reserved a room at the Sheraton Iguazu which is in Argentina. Interestingly, all of the internet search engines showed that both the Foz do Iguazu Hotel in Brazil and the Sheraton in Argentina were full, but with a call directly to the hotel, we had no problem getting a room with a falls view! That's a tip to remember. We decided that was enough planning for us.... Rio we should be able to do in our normal fashion without reservations because there are plenty of hotels available. What better place to start our Brazilian adventure than Rio De Janeiro. That's a question we get all the time. There are warnings about theft and street crime, but if you exercise caution, you should be just fine. We were warned repeatedly about safety in Rio--at home before we left and at our hotel. We never felt unsafe, but we went beyond even our rules about only minimal jewelry.... I didn't wear any... not even my cheap travel watch. As to dressing to blend in... my culottes and shirt and Mark's shorts and shirt passed for beach cover-ups, so we were only a bit overdressed, but we stayed alert in crowds and had no problems. We arrived in Rio without reservations and used the airport Tourist Information Desk to choose a couple of hotels that we might like. Then we took the advice of the tourist desk employee and caught the bus to town. This kind of travel is easiest if you travel light.... Remember?.... One carry-on only. This was an airport bus that made stops in the downtown area that we wouldn't have time to visit--the downtown market, the downtown airport, then a drive along the beaches, and it dropped us off about a block from our hotel. It took only about 30 minutes longer than a cab and cost about one-fifth as much.... and we got a brief tour of town on our way in. We found a delightful local hotel right on the beach at Ipanema, and it didn't take us too long to get down by the water to have lunch of octopus salad and start recovering from jet lag with a walk on the beach. We try to plan easy, outdoor, walking activities on the day of our arrival. Sunlight and exercise help reset your biological clock and get over the jet lag sooner. We think this works better than just crashing and sleeping in your hotel... only to be awake all night. 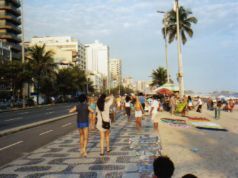 Ipanema and Copacabana were beautiful and amusing. For Cariocas as the residents of Rio call themselves, the beach is their backyard. School groups were out playing soccer and volleyball, family groups were partying, adults played very competitive games of volleyball and everyone was promenading along the broad sidewalks.... each one paved in a distinctive black and white pattern depending on which beach it bordered. There were plenty of vendors selling food and towels and bikinis. Dressing for the beach is a way of life. Mark tried to talk me into buying one of those bikinis. Don’t worry, I managed to resist. As a baby boomer, my bikini days are over, although most of the Brazilians didn't worry about that! Portuguese is the language of Brazil, but we got along fine with our guide book to point to, a phrase book, and the few polite phrases that we mastered. Rio is Brazil's signature city, and it has the country's signature emblem. 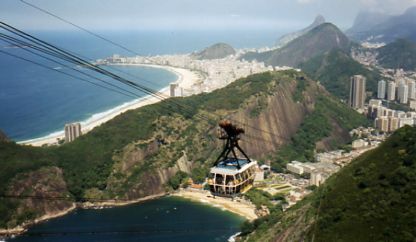 Rio is beautiful, and part of its character is its mountains which not only surround it, but weave through it. 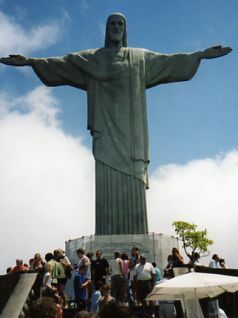 the Christ the Redeemer statue. Cabs are plentiful and reasonable. 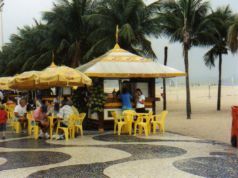 Walking though the neighborhoods around the beaches, we found the bar where the song, "The Girl from Ipanema" was written, and we window shopped at the boutiques and jewelry stores. Three days was enough time to explore the beaches and get the feel of Rio, but we didn't have time to see the museums downtown or the favelas... the slums that tumble down the hillsides right to the rich areas that border the beaches. We did find time to enjoy Brazilian food traditions such as rodizio. That's one that could do you in! It isn't just barbeque on a rotisserie, but a carnivorous all-you-can-eat feast where troops of waiters circulate with every kind of grilled meat you can imagine. It was an amazing display and absolutely delicious. Whew, good thing there are miles of beach to walk. We also tried feijoada.... which is a Saturday tradition.... sort of a Brazilian Grandmother's stew of everything that's left at the end of the week. It's based on black beans and served up in a pot that contains bacon, salted pork, ribs and sausages as well as certain other pig parts like ear and tail. All of this is accompanied by white rice, farofa (fried Manioc flour), kale and oranges. To say it's a hearty meal would be an understatement. We skipped the tail and ears, but it was good. We flew to the wild, wild west of Brazil to spend six days in the Pantanal. 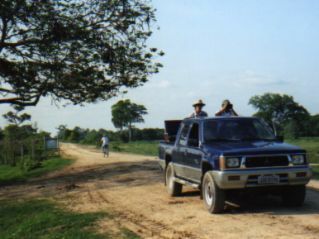 We landed in the central Brazilian city of Cuiaba, met our guide, climbed into the back of his truck, and drove for six hours on the Transpantaneira Highway, a raised dirt road littered with rickety bridges that is the only way through the region unless you go by boat. It was the end of the dry season when we were there, so the Pantanal looked like the cattle country that it is. Huge fazendas (Brazilian farms or what we would call ranches) spread for miles. Once the rains come, the entire area becomes a swamp. 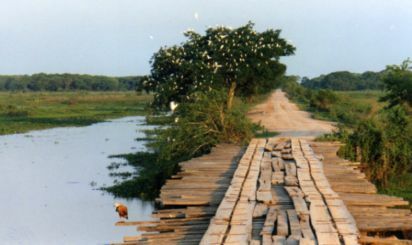 The cattle are herded to small sections of high ground or to market, and those raised dirt roads and bridges are ribbons of high ground in a sweeping expanse of water. We stayed in a small lodge that was run by Pantaneiros... the cowboys of the Pantanal. The Jaguar Ecological Reserve provided a safari type experience--Brazilian style. 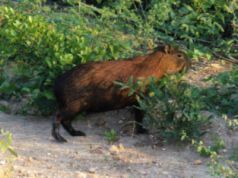 We did see an Ocelot, a Giant Anteater, several Tapirs, Crab-eating Foxes, Crab-eating Raccoons, Giant River Otters, and lots and lots of Capybara, Agouti and Coati. We heard and saw three kinds of monkeys: Black-and-Gold Howlers, Brown Capuchins and Black-tailed Marmosets. There were early morning walks and game drives, late afternoon drives, and after dinner night drives. 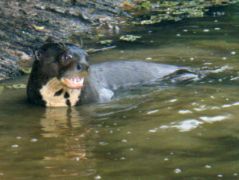 We did see an Ocelot, a Giant Anteater, several Tapirs, Crab-eating Foxes, Crab-eating Raccoons, Giant River Otters, and lots and lots of Capybara, Agouti and Coati. We heard and saw three kinds of monkeys: Black-and-Gold Howlers, Brown Capuchins and Black-tailed Marmosets. There were early morning walks and game drives, late afternoon drives, and after dinner night drives. Eduardo was a bird watching guide so we saw so many species of brown woodcreepers and tody flycatchers that even WE felt overwhelmed. On the “LOOK AT THAT” side, there were Hyacinth Macaws nesting outside our room, Toco Toucans all over, and there were other fun big birds like Greater Rheas, Great Potoo, Southern Screamers, Blue-Throated Piping-Guans, Chaco Chachalacas, Southern Caracaras and Bare-Faced Curacaos... and all kinds of little birds in bright colors. Let’s not forget the reptiles. No Anaconda, much to my disappointment, but we did see a couple of small snakes, some big Tegu lizards (three feet long) and hundreds and hundreds of Pantanal Caiman. It was spooky catching all the eyeshine of all those reptiles in the marshes at night. We went on night drives every night. Our only disappointment... we did not see jaguar... though our guide’s dad saw three (female and two nearly full grown cubs) early one morning when he was going fishing, and a neighbor saw one down a road that we drove several times. We looked in both locations, but the best we could do was some great tracks. 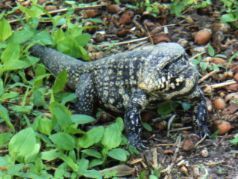 During the middle of the day, when the animals were hiding in the shade and the birds were quiet, Eduardo took us to meet his uncles and neighbors who were scattered around the sparsely populated Pantanal. We got to see how the Pantaneiros live, and we met a few local characters who thought we were pretty funny too. A large part of the fun in any trip is interacting with local people.... it adds to your understanding and theirs.... it adds depth making it travel instead of just sightseeing. Brazil is such a big country that it's necessary to fly from one destination to another. In the past, local air carriers offered country passes that saved money. We ended the trip in Iguazu Falls which was in full flood -- an awesome sight. The widest waterfall in the world, it’s a 1.8 mile wide wall of water crashing down 200 ft. 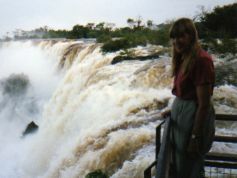 There are airports near the falls in both Brazil and Argentina. We flew to the Brazilian side, and found a hotel at the entrance to the national park. Before the park opened the next morning, we took a helicopter ride to see the magnitude of the falls from above. We took the park service bus in and first explored the falls from the Brazilian side where we had wonderful views across the gorge to the falls. From our hotel at the park entrance, we were easily able to arrange for a taxi to take us from Brazil to our hotel in Argentina. We explored the possibility of renting a car which would have given us more mobility to explore the whole region, but with only a couple of days and so much to see within the parks, we decided it was easier and cheaper to just take taxis. Arranging a taxi for our return to Brazil was no problem either. Crossing the border is not problem, you just have to be sure to allow enough time in case there is a lot of traffic. Arriving on the Argentine side, we were so close we could hear the falls before we could see them. A short walk from the hotel, catwalks take you right to the edge of the falls on the top, and you walk along for a mile watching the water crash at your feet. Another trail takes you to catwalks that get you as close to the bottom of the falls as the falling water will allow. Board a small tourist train through the forest with drifting flocks of butterflies and you arrive at yet another trail that takes you to the most dramatic section of the falls..... 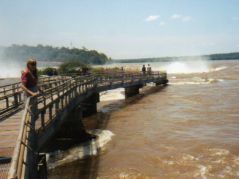 The catwalk crosses a wide expanse of the river, and then you are at the top of the Devil's Throat... a horseshoe shaped wall of thundering water and enveloping mist. After exciting and sometimes drenching walks along, above and below Iguazu Falls, it was wonderful to return to the hotel and sit on our balcony with some local wine, enjoy the view and reminisce about the whole trip. The Sheraton was a bit of a splurge for us, but our room with the falls view was definitely the way to cap off the trip! Sometimes setting up a tour works best for remote destinations, but you don't have to join a group; you can arrange a small group custom tour just for two or four. Use the airport Tourist Information Desk. In Brazil they helped us find a nice hotel in Rio and gave us good advice on how to get into town. If you're going to be traveling around a country, sometimes it pays to arrange ahead for your transportation. You can often get better deals if you get an airline pass or a train pass before you leave home. Sometimes you can get great deals booking on the internet... but don't always believe it when you read that your choice is full. It might pay to call the hotel directly as we did. And of course, my mantra... pack light, dress to blend in, stay alert, but also trust the locals to help you and show you a good time.